Kell brings 3.5 years of Drupal experience to his role of Drupal Developer. 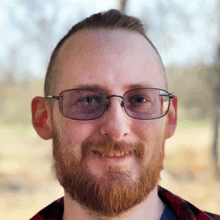 He's worked on a variety of projects from creating event management calendar systems with Drupal to Drupal custom development and site-building. Before beginning his path to development, Kell worked in factories, roadwork, retail, and warehouses looking for what he truly enjoyed out of a career. After several failed attempts, he took six months off work to teach himself a skill that could define his career. He jumped headfirst into coding. After being hired at a small agency, he moved to a Drupal-focused marketing and web development agency which challenged him and further honed his skills. This path brought him to his Developer role at Mediacurrent. Kell loves all types of games from board games to video games to wordplay games. He has extremely sensitive senses, meaning he has double the number of taste buds as regular people and can hear outside of the normal human range.